Waiting for the seasons to change is the strangest feeling, isn’t it? Labor Day has passed and we’re well into September - all I want to do is bust out my sweaters and tights and jump into a pile of leaves. The weather, of course, isn’t in the mood to cooperate, so instead I’m just… sweating. Profusely. On a day to day basis I’ve found myself pulling the same few sundresses out of the closet, so this top has been a good excuse to switch things up a little bit. 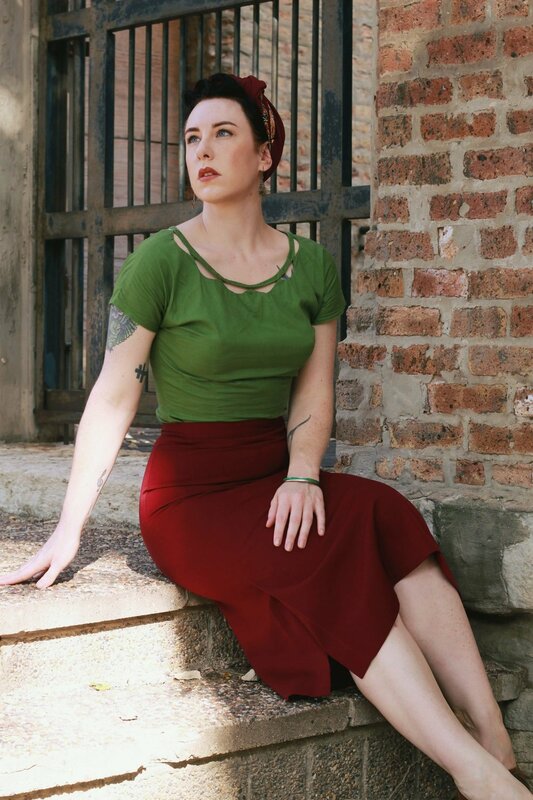 I’m absolutely in love with the neckline detail, and the beautiful grass green color pairs nicely with the richer colors of fall, like this burgundy skirt. Even though I’m ready for fall, I’m trying not to let the last bit of summer get away from me. There’s still a ton of time for barbecues and sundresses and beach days! How are you guys planning on closing out the summer?